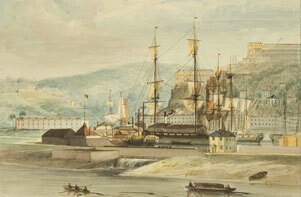 In 1809 Bristol was transformed by the opening of the Floating Harbour. 80 acres of tidal river was impounded to allow visiting ships to remain afloat all the time. Over the next two centuries the Harbour grew as a busy commercial port until it closed in 1975. Since then, it has been regenerated for leisure, commerce and residence.